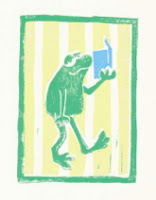 We talked about Erin Stead's beautiful pictures made using linoleum blocks and pencil, and I showed them a few linoleum blocks and explained the print-making process. Some of the kids were positive that Fritz had actually been turned into a duck, and others were just as certain that he had not. They made some fairly convincing arguments. When I asked what they were afraid of, not one person mentioned food. Maybe they've never been stalked by carrots. I recently discovered Show Me a Story: 40 Craft Projects and Activities to Spark Children's Storytelling by Emily K. Neuburger. (Thanks to Anna Lewis for the recommendation in her blog post on I.N.K.) My copy now has a colorful array of post-it flags marking pages I want to return to. The author includes clear instructions for making story disks, story stones, traveling puppet theaters, story blocks, and other craft projects that encourage creativity. She also includes ideas for sparking imaginations and telling stories. Most of the projects can be completed with supplies that are inexpensive and easy-to-find. We decided to use fall break to make some story mats--all it took was some canvas, paint, fabric scraps, and imagination. Let's make some stories! 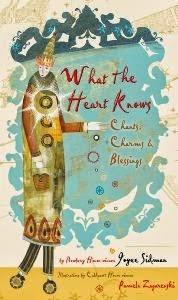 For the past week, the book that has sat on my bedside table--the one I've read and re-read--is Joyce Sidman's poetry collection, What the Heart Knows: Chants, Charms & Blessings. These twenty-nine poems, each illustrated with the inimitable artwork of Pamela Zagarenski, offer hope, express grief, look to the future, and recall the past. In her Note to Readers, Sidman wrote, "We still believe in the power of the words themselves." Sidman displays that power here. She puts into words the raw emotion that we carry in our hearts, giving it shape and definition. Some of these poems feel intensely personal, as though I could have written them if only I could have figured out how to say what exactly I felt. I had thought to cite some of the most effective examples, but to pull a few words or phrases from their places, robs them of some of their power, so instead, I'll just recommend getting a copy of the book and reading the poems yourself. My current favorites are "Chant to Repair a Friendship," "Song of Bravery," and "Blessing on the Downtrodden." Read them and find yours. I know winter is on its way. And even though I'm sorry to give up my garden and lunches of fresh tomato and basil sandwiches, I love the magic of winter's first snow. Jonathan Bean's new book, Big Snow, captures that magic. David waits, with his sled at the ready, for snow to fall. When his mom suggests that he help make cookies, he starts with good intentions, but the "flour, white and fine" reminds him of snow and "he [decides] to check the weather," leaving a mess in the kitchen for his mom to clean. He tries to help clean the bathroom and change the sheets, but at each attempt, he is distracted and runs out to "check the weather." That evening, the snow David has been looking forward to all day finally covers the ground, and David and his parents bundle up and go out into the wintry neighborhood together. One of the things I most enjoy about this book is its balanced structure. Pages showing David inside his home alternate with zoomed-out double-page spreads of David's neighborhood where he checks on the snow's progress, creating a pattern that is emphasized in the text. "Flour, white and fine" is a preview of "small flakes . . . white and fine." "Suds, white and fluffy" precede "flakes . . . white and fluffy," and "new sheets, white and cool" anticipate "the snow . . . covering everything, white and cool." The pattern breaks at the story's climax when David dreams of a big snow, which in turn, leads to the resolution ("Then David, Dad, and Mom went to check on the big snow.") 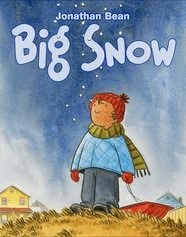 that wraps neatly back to the title page where we first saw David waiting under the title "Big Snow". The illustrations depict David's neighborhood--not just any neighborhood--but one that you would definitely recognize if you visited it. Closely-spaced, two-story homes on deep, rectangular lots with clotheslines in the backyards and power lines running above the sidewalks give this neighborhood a distinctive sense of place. Add to that details like a Menorah in a back window, a mailman with a walking route, covered porches, and low hills on the horizon, and you just KNOW this is a place that you could find on a map and visit. In those repeated double-page spreads of the neighborhood, we see the accumulation of snow, we see the background fade into white, we see lights from the homes and streetlights, and we feel the hush that comes with snowfall. Small houses and smaller people make the snow--the wondrous, magical snow--feel BIG. David is always at the forefront of the story. He is the one pictured talking; his mom may say something in the text, but the pictures are all about David. He dances in flour with the abandon of childhood (my favorite picture) and plays in soap suds with vigor. He tosses his coat, scarf, and mittens to the floor, only to pick them up again as he runs out the door. There is no apology for his eagerness to see the snow. And then let's talk about what is NOT in the text. While Mom makes suggestions to keep David busy and is left to clean up a mess every time he tries to help, she doesn't scold him. The pictures clearly show her aggravation, but the story stays with David as he rushes outside. Here is a kid being a kid in the best kind of way. Winter usually comes too early where I live, but reading this story makes me long for a snow day! Check out interior artwork here. Have you ever wanted to go just a little bit wild? 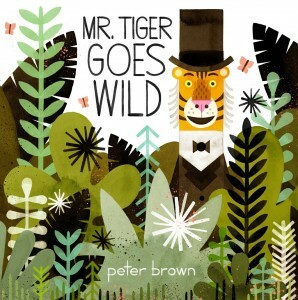 In a perfectly proper town, Mr. Tiger is ready to let loose in Peter Brown's new story, Mr. Tiger Goes Wild. While everybody else is happy with their subdued, calm and boring lives - Mr. Tiger is looking for change. It starts gradually (walking on all four legs), but as he grows more wild (and sheds his clothes), his friends kick him out of town. He is happy to go to the wilderness where he is free to go "completely wild!" He loves climbing trees, running through grass and - pretty much doing everything tigers are supposed to do, although the delightful pictures still show an animal with some residual proper tendencies (the way he climbs a tree still doesn't feel entirely tiger-like). The story resolves in an unexpected, happy ending which proves that it is always better to be yourself. The artwork is almost entirely done in gray/brown hues with a just a punch of orange to represent Mr. Tiger. Using a combination of India ink, watercolor, gouache and pencil - which was then composited and colored digitally, Peter Brown sets up a perfect contrast of uniform city life and the lure of a wild (and much more colorful) wilderness. The overall effect is perfect for the story and you find yourself rooting for that flash of orange on each page. I highly suggest taking a walk on the wild side and picking up this book today. It is a fun read aloud with interesting pictures and a sure-fire hit for children of all ages. You may even get a few laughs with the pure absurdness of wild animals living lives completely contrary to their natures. At one point the teacher tells the children (consisting of a rhino, bear and pig), "Now, children, please do not act like wild animals." Of course, the best part is that while the animals in the story can't see the irony - children certainly will! So, follow Peter Brown's advice on the dust jacket, because "everyone should find time to go a little wild." This is a really fun picture book. With its exciting pictures and funny words, it keeps you captivated. This picture book is about a small dragon at bedtime. 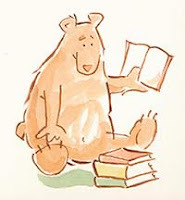 He doesn't want to go to bed, but as his mom reads the book again and again, the words change as she becomes more tired. And the small dragon becomes more and more angry. 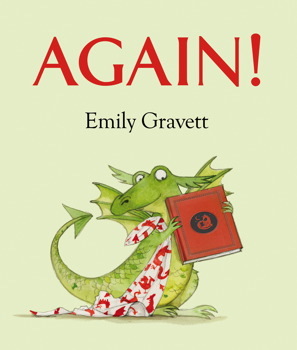 With the merry rhymes that make the book flow, and the funny story plot, this book is awesome. "Cedric the dragon's a bright angry red. He's never, His whole life, (Not once) been to bed. . . . At the end of each day he shoats out this refrain: 'TOMORROW I'LL DO IT ALL OVER AGAIN!'" "Cedric the dragon's a big sleepyhead. He's decided it's time HE WAS REALLY IN BED. . . . Now I'm closing the book and saying quite plain: 'TOMORROW I'll read it all over again.'" I especially love the pictures of the cute little dragon and his mom as they go through the routine that every parent dreads, but still goes through, as their kids try to go to sleep. This is a really fun read aloud to little kids. Also, it is one of those books that you can read again, and again, and again--even though you already know the ending. If you go to her website and go to "Books", and then to "Coming Soon" and click, "Sneak a peek", you can look at two of the pages of this book. Also, it is just a fun website for activities that relate with her books. And thanks to 100 Scope Notes for the cool videos on how it was made! If there is a book from this past year (published 10/1/2012 through 9/30/2013) that you think deserves a little recognition, you should nominate it for a Cybils Award. Starting today you can clink on this link below to nominate your favorites--one book per category. Don't procrastinate, nominations close October 15.